Everybody knows that guy. He’s down on his major, he’s pessimistic about the future — basically he acts like he’s the only person to ever be out of a job. 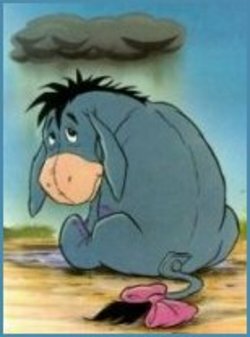 It’s hard to be around “Eeyore” because of his gloom and doom attitude. And unfortunately, he’s probably making it harder on himself. If you suspect, deep down, that you might be harboring some sad donkey tendencies, consider the following mopey myths about job hunting. The Myth: I should have chosen a different major. When you don’t find a dream job right after graduation, it’s tempting to blame your degree major. But even the most practical, sought after degrees need a boost from you. That business degree doesn’t prove that you can interact with clients and pitch bold proposals — that’s also a matter of personality and attitude. Instead of second-guessing your credentials, focus on making your attitude more desirable. Be positive during interviews, take the initiative in your “pay-the-bills” job, and attend networking events. Your degree is a launching pad, but personality and motivation augment it exponentially. The Myth: Finding jobs is a matter of luck. Whether it’s due to being blessed with connections or brilliance, some people seem to just stroll through life and have opportunities thrown at them left and right. Eeyore might suggest that since it’s all a matter of luck anyway, you may as well sit back and wait for the fates to grant you a great career–or not. Instead of making excuses about your personal job search, don’t count on chance. Believe that you deserve a great job, and make your resume and public profiles reflect that. Flaunt your skills and engage in a little shameless self-promotion. Then, rather than whining to your friends who seem to have it all together, ask for a reference or referral to someone in management to get your own career started. The Myth: I’m qualified and nothing else should matter. Strolling into an interview thinking you deserve it (or worse – are above it) is the absolute worst thing you can do. Job searching is about selling you, and it’s a skill that takes time to master. Research employers, follow news and journals in your industry, and take every botched interview and missed opportunity as a lesson, not a stumbling block. Eeyore’s catch phrase, “Thanks for noticing me,” speaks volume about his character, and about the defeatist culture he represents. As a potential hire, are you getting noticed for the right reasons? If your Facebook is full of negative statuses about your former employer, future bosses may expect the same treatment and avoid you altogether. A bad attitude affects people’s perceptions of you and your abilities. Beyond fulfilling the requirements for a position, find the enthusiasm necessary to get the work done. There’s always someone who can learn what you know and do what you do, so use your personality to make yourself irresistible and irreplaceable. About the author: Zach Buckley is a freelance writer who is interested in exploring the intersection of culture, science and education. He lives in the Midwest and enjoys music, literature and good food. This is definitely true! A positive attitude can make a much bigger difference than most people think, and often improves the attitudes of people around you as well.